One of the scariest things about ADA Compliance for business owners is the lack of a definitive price. If you ask an ADA Consultant about their services, they will give you a wide range of prices for just their service. If you are in California, such an ADA Consultant may mention CASp — the median price of which will be around $2400. CASp has a host of significant benefits, but also some responsibilities for the person getting the survey. But assuming that you, a small business owner, can even afford $2,400, you’d probably be scared stiff about the Pandora’s Box of cost an ADA Consultant could discover. CASp surveys only find issues, they don’t fix them. Any ADA survey is only the first phase of ADA compliance. No survey — not even CASp — can stop all lawsuits from happening. The only way to completely remove your liability is to become 100% ADA Compliant, which in many cases is prohibitively expensive for a small entity. However, knowledge is power, and a survey does give you the power to significantly reduce your liability. In order to ward off lawsuits, you’ll be able to fix many of the glaring problems. But what if the survey turns out major problems and you’re suddenly were on the bill for some unknown huge amount of money? Getting your access advice from a contractor is especially scary in this regard because there is always the temptation for them to say you need more expensive fixes than are really necessary. But don’t worry too much. The majority of issues for ADA compliance can be quite inexpensive — or even free. Understand that the inexpensive fixes are the ones which serial litigants use to target businesses. Not fixing something which is “readily achievable” makes a business look negligent. Also, given the relative complexity of the both state building code and the different Federal standards, knowing exactly what to do (without making yourself more liable, should you fix the wrong thing) can be quite difficult. But now you can stop worrying. This guide is meant to explain the costs of ADA compliance to you, as a small business owner. So as a small business owner, let’s say you own a small restaurant in a strip mall. Your typical eatery will have around 20 seats. Your average cash flow will be, let’s say, $40,000. What is your liability going to cost? First off, you’re a small entity. Your threshold for “unreasonable hardship” is low. You are still liable but what you are directly responsible for won’t be enormous. You’re also renting in a strip mall, so your parking lot is shared. It’s true that you’re still liable for the parking — parking does need to be addressed — but you share this liability with the property management company and landlord. In order to get anything fixed you’re going to have to talk with them. The same is true for any truly expensive renovations. Moving restroom walls, enlarging spaces — all of these require some communication with the property manager. If this management company is huge — while you both share liability, their fiscal responsibility in this matter is greater than yours. For you to afford CASp would be nearly an “unreasonable hardship” in itself. We wouldn’t recommend that you get a CASp survey. If anything, you should try and get the property management company to get a CASp survey of the entire strip mall, that way all the businesses, including yours, can be covered. If they refuse to get CASp then your best bet is to educate yourself with an access survey so you can at the very least fix the most dangerous problems. So what can you expect to pay for? You might have to replace or modify some door hardware as well. We would recommend that you get our recommendation letter. It lists the important issues even if it doesn’t carry the protection and liability that comes with a CASp survey. The cost of everything here, including the letter and the fixes is, broadly speaking, maybe $1,000. Also, don’t forget: As a small entity, you do get the tax credit of up to 50% on ADA compliance from IRS form 8826. Our recommendation letter is covered in that amount. This doesn’t mean that after you’ve done this work that you’re off the hook for ADA compliance. You still need to comply with the other ADA violations in your parking and restrooms. Work with your property management company. Talk with your neighbors. If you can get them to hire a CASp surveyor to do all the stores, all the better. Get them to fix the parking the restrooms too. After all, they own the property. It will be good for all their future tenants. For them, it’s a solid investment. 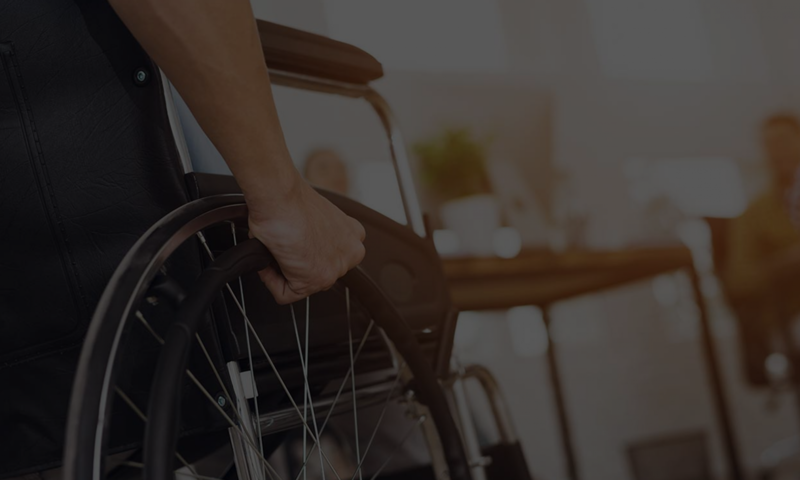 If your property manager is unresponsive or unwilling to do ADA work (they may incorrectly think that the facility is already compliant) then they are exposing you to a huge lawsuit risk. Armed with our recommendation letter or exposure report, you can make your property manager aware of the issues in a registered letter. This may significantly reduce your liability in itself by leaving a paper trail that you are exercising good faith, and attempting to do what is right to comply. With the recommendation letter, you can and should fix the readily achievable items anyway, they don’t cost that much — and they reduce your liability up to 87%. Your best long term ADA Compliance solution is to move to a location that IS ADA Compliant. How can you tell if they are ADA compliant? Make them get an exposure report to list everything, or ask to see their CASp report. You work in an office building. You lease your office suite. Your private practice makes somewhere between $250,000 and $500,000. You’re still not alone in your responsibility for the parking lot, because it’s shared. Additionally, the restrooms you have are private. You don’t allow any public access to them. Any of your clients looking to use the restroom would borrow your key and use the restrooms in the hallway. The lobby, elevator and restrooms are all shared between you and the other office tenants. Even though the liability is shared, you are still liable for everyone coming from the public right of way, or parking, traveling through the lobby and the elevators and using all the public areas and talking through your office door into any conference room. If you are named in a lawsuit, you will have to deal with it, which probably does mean settling for damages even if you are not the only entity responsible. You can afford to make readily achievable fixes. We would make the same recommendation as case 1. Your property management company should get a CASp inspection to protect all the businesses inside the office building. Barring that, if they are unresponsive you can get a recommendation letter for everything affecting your office. You should then fix the items you are directly responsible for and forward everything else in a registered letter to your property management company. This way, their responsibility is made clear. If they are still unresponsive, your best long term option is to move to a location that is accessible. Imagine you own a small successful franchisee store, maybe two of them. They could be McDonald’s, or Long John Silver — it doesn’t matter. Your cash flow is close to $1,000,000. You can afford much more, in terms of fixing things. So your threshold for unreasonable hardship is much higher. You can do all the “readily achievable” fixes. You can also afford CASp. We would recommend that you get it. The advantages are many, including a 90 day stay (meaning the opposing attorney can’t rack up fees during those 90 days) and expedited arbitration (also lowering your court fees). These things, of course, won’t deter someone who really wants to sue you because they are trapped in your restroom over night. CASp will deter a serial litigant who wants a quick and easy ADA lawsuit threat and a fast no-hassle settlement. (No hassle for them). So, if you own the store, or not, you are in a stand-alone store. You have parking that is unique to your store. This means that even if you are leasing, you are even more responsible for the parking. Not only that, you can still afford to get the parking that services your store re-striped. You might qualify for IRS Form 8826 if you make less than $1,000.000.00 in gross receipts and have no more than 30 full time employees. The restrooms could be a little more difficult, if they are older. If the restroom walls are load bearing you might not be able to afford moving them right away. So that item would have to be deferred, so the cost of ADA compliance is spread over two or three years. If you qualify for IRS Form 8826, you can get a tax credit so your cost will be much lower. After getting a FULL ADA inspection of everything you can then start to repair everything. You will spend, maybe $10,000 on accessibility and over the course of two or three years fix everything. At the end of three years, you will have a brand new looking restroom, doors and counter to show off to your customers. You manage many properties, maybe 50 or 200. You have several offices all over the place. Your financial resources are deeper. You don’t qualify for IRS Form 8826, although if you have subsidiaries, they might. You’ll have to check with your accountants.Your tenants have been probably been hit with ADA Lawsuits before. Your tenants may or may not have notified you, simply because they were unaware of your shared responsibility. Nonetheless, responsible property managers want to do the right thing. You’ve probably had some ADA surveys performed, but they were not full ADA inspections. You haven’t gotten a CASp Report because you haven’t heard of it. You should get CASp for all your properties. Since CASp determines a timeline, you should fix as much as you can according to a timeline, deferred over a few years (I can’t really estimate in general how much you should spend but you should fix the issues) and then advertise your sites as being ADA compliant. Post the CASp certificate on all your storefront windows. If you don’t, you are bound to start losing tenants as they become aware that they are leasing properties not in compliance with the law. But what about the long-term ramifications? Smart real estate agents will get an ADA survey for all the properties they have an interest in. ADA Compliance is a great fear among many current leasees. Not only that, but there is some interest in the state assembly to forward some ADA liability to Real Estate Agents who lease or sell property that isn’t ADA compliant without full disclosure. Better get a jump on compliance. For every property a real estate agent deals with, your agents should order Exposure Reports of property they are looking to broker or CASp surveys on property they manage, so they can leverage the cost of ADA compliance into the leasing, selling (or buying) price. So now that you’ve read this, you can begin to put a price tag on accessibility. No one is responsible for fixing all the ADA violations in the world, just your corner of it. And if you are a tiny shop struggling to keep your doors open, you should get together with your neighbors. Get together and bug your property management company. Tell them they are putting you all at risk by ignoring these issues. After all, fixing a few hundred dollars worth of issues is better than getting a lawsuit. After you’ve got the lawsuit, you have to deal with it on their terms, which won’t be to your favor. You’ll be court ordered to fix this stuff anyway — on top of throwing money away on a settlement. We’ll even give you a discount for not making us drive out there separately. You can forward your parking issues and your major liability issues to your property manager. If you decide to upgrade your survey to CASp you may get a significant discount. If your property manager decides not to do anything at least get us to look at your stores collectively. That way you can protect yourself before you move to a property manager who actually wants tenants. What are you waiting for? Find out how inexpensive ADA compliance can be! You already have an idea now. CASp Architects are waiting! We have a variety of ADA compliance products to fit your needs. Call us at 866 982 3212, extension 1! Or email us at help@accesssolutionllc.com. We will be happy to assist you. Our advice is always free. Previous PostPrevious ADA Compliance Options: Why CASp?